Western blot analysis of recombinant truncated Rb, without or with Rb blocking peptide, using Phospho-Rb (Ser780) (C84F6) Rabbit mAb. 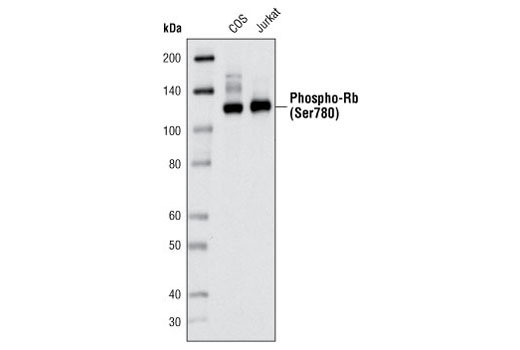 Western blot analysis of extracts from COS and Jurkat cells using Phospho-Rb (Ser780) (C84F6) Rabbit mAb. 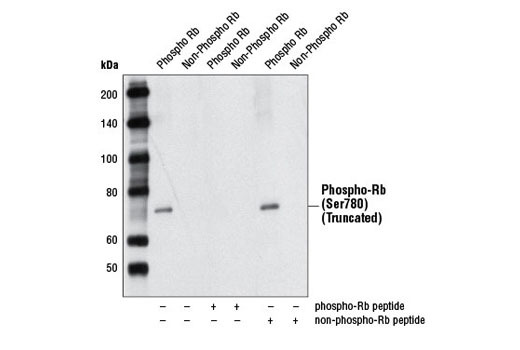 Immunoprecipitation of phospho-Rb (Ser780) from Jurkat cell lysates using Phospho-Rb (Ser780) (C84F6) Rabbit mAb followed by western blot using the same antibody. Lane 1 is 5% input. 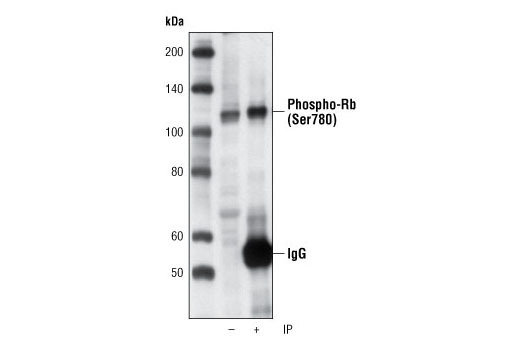 Phospho-Rb (Ser780) (C84F6) Rabbit mAb detects endogenous levels of total Rb protein only when phosphorylated at Ser780. Monoclonal antibody is produced by immunizing animals with a synthetic phosphopeptide corresponding to resudues surrounding Ser780 of human Rb protein.